Yeah, but: Am I backwards? The Long Version: Three-way lamps are lights with three distinct brightness levels, either by using three separate bulbs (as above) or by using a special bulb . 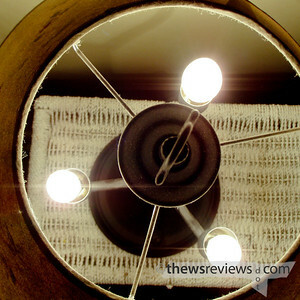 The multi-bulb lamps will turn on one, two, and then all three; single-bulb lamps light a small filament, larger filament, and then both together. In all of the lamps that I've ever seen the brightness cycles through low, medium, and high. This is the exact opposite of the way they should work. When I first turn on a lamp, I do it because I want more light. The three-way responds by going to its dimmest setting. I then have to turn the switch two more times. There are many times when I'll want less light. Whether reading at the end of the night, or setting a mood over dinner, when I'm finished that activity I want the lights to go out. Instead they go up. Didn't anyone actually use one of these before putting it into production, and why has nobody created one that works properly?